Whether we’re talking about a household emergency lasting a few days, or a major disaster affecting the entire country and maybe beyond, if your world gets turned upside down, having access to a literal library of knowledge quickly becomes an invaluable ally when times are bad. While learning as much as you can beforehand will always serve you well if things start to go south, there are simply not enough hours in the day to cover everything you could ever need or want to know in the case of an emergency event or a long-term disaster scenario. Stocking up on the best books for every eventuality is undoubtedly one of the key strategies to adopt when it comes to advanced preparedness, but unfortunately, in the event of a rapid evacuation or bug out situation, the physical limitations of physical books soon become all too apparent. It would of course, be ideal to bring the best first aid book, wilderness survival guide and your favorite literature along if you need to leave home, however the realities of space and weight constraints quickly push these to the bottom of the list of packing priorities when there are the crucial considerations of shelter, water, and food to factor in beforehand. This is where ebook readers such as the Amazon Kindle and others have utterly transformed the game when it comes to carrying knowledge on the go. Offering the ability to carry literally thousands of books with you at a moment’s notice with minimal weight implications, alongside a super-slim and packable profile, as well as providing enough battery life to last you for weeks on end, preparing a bug out kindle which you can grab and pack in an emergency is one of the best things you can do when preparing for the worst. 1 Why Prepare a Bug Out Kindle? Why Prepare a Bug Out Kindle? The most obvious benefits of preparing a bug out Kindle are those relating to the practicality of being able to store an almost limitless number of books (and therefore easily accessible knowledge) in a footprint which can be slipped into a bug out bag between your other packed items. With this primary benefit in mind, you can quite literally carry the equivalent of an entire library-worth of books in a package only 0.36″ thick and weighing as little as 5.7 oz. Generally speaking, it’s generally a good strategy to avoid too many digital or electronic devices when it comes to preparing a bug out bag or bug out vehicle inventory due to the constraints of battery life and durability of this kind of equipment under high-stress situations. There are however some notable exceptions to this rule, in the case of high-quality flashlights and tactical watches, both of which are specifically designed for this type of environment. We’d also argue that added to this list of electronic exceptions should be a durable ebook reader. With that being said, in all of these instances the same rule always applies when it comes to bugging out – if the devices make the cut and get added to the packing list, they have to be able to perform under any situation and must have the battery life to go the distance whatever happens. Outside of offering in-depth and precise practical survival skills and advice, preparing a survival Kindle or ebook reader provides the ability to offer entertainment and morale-boosting when times are dark and can quite literally make all of the difference to your overall state of mind. 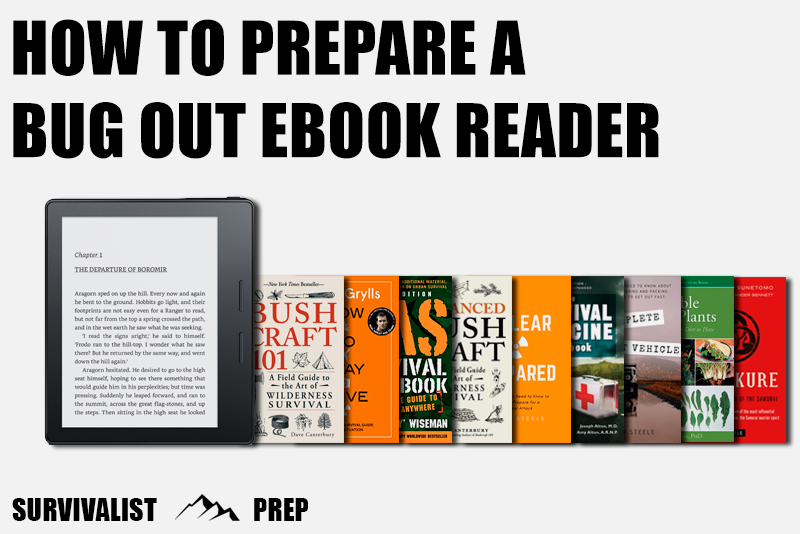 Ensuring access to a wealth of potentially invaluable information during a crisis means that preparing and packing a bug out Kindle is one of the best things you can do to maximize your chances of persevering in an emergency situation. A survival Kindle or ebook reader suitable for the purpose of bugging out or evacuating your home during an emergency needs to be equipped (both physically in its construction as well as with the books you load onto it) with the feature set and functionality to help you weather all conditions. In some ways, the term bug out Kindle isn’t particularly accurate – at least not if you consider the wide application of a fully stocked survival ebook reader as part of your preparations for riding out a disaster or emergency situation at home or from a pre-determined safe location. If you find yourself bugging in in these examples, the ability to call on a single point of information or knowledge and have it on hand at all times can prove invaluable, particularly as you may not be able to guarantee the continuity of any physical books in your home. When it comes to choosing the best ebook reader for the job, the leader of the pack in terms of reliability and functionality definitely comes in the form of the Amazon Kindle range of devices. 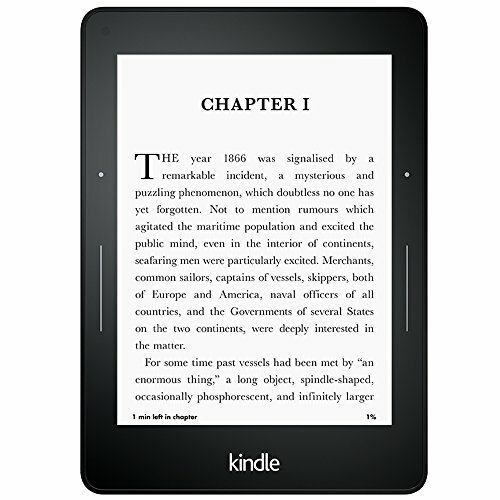 Offering the perfect combination of storage capacity, durability, battery life, compatibility, and of course, size and weight, the latest Kindle range of ebook readers are perfectly equipped to deliver everything you could need from a bug out survival ebook device. 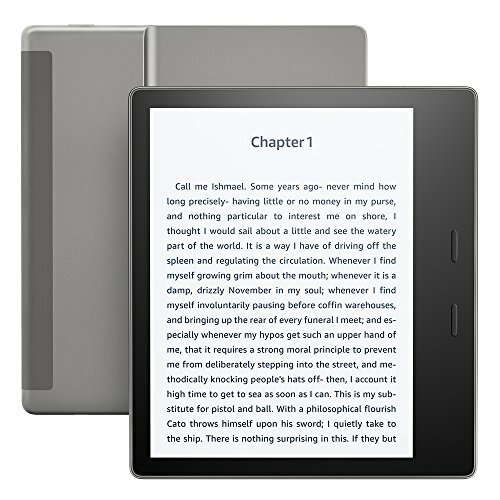 The ebook readers within the Kindle range come in at a variety of budgets and each offer a unique set of features and functionality (as well as differing in dimensions and weight). The latest iterations of Amazon’s Kindle range of devices offer an excellent set of features that make them ideally suited for use as a bug out bag ebook reader that you can easily pack up and take with you whether you’re evacuating on foot or bugging out by vehicle. With each device offering weeks of battery life on a single charge, significant storage space and a compact footprint, building a survival ebook repository around one of the Kindle devices really is a great way to go. The latest generation of the original Kindle is the lightest yet, weighing in at just 5.7 oz (161 g) and measuring a mere 6.3″ x 4.5″ (160 x 115 mm). Both of these incredible stats make this the perfect survival e-reader if space and weight are at an absolute premium in your bug out bag. Coupled with the lowest price tag of the range, the original Kindle is also an excellent choice if you’re on a tight budget. 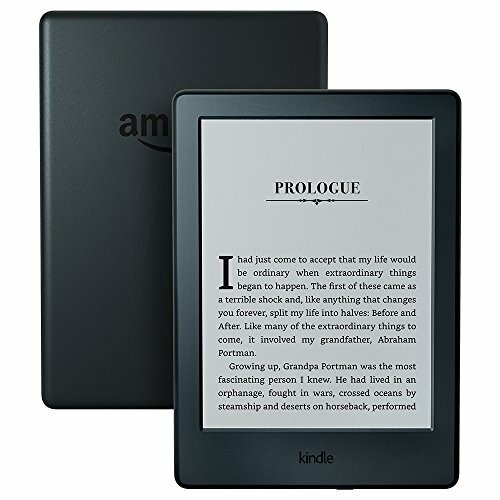 Offering a resolution of 167 ppi and a 6″ glare-free screen, the Kindle provides 4 GB of storage with enough writable space to hold somewhere around 3500 books. The battery life on the Kindle is awesome, lasting for weeks on a single charge however unlike the higher priced models in the Amazon family of e-readers, the entry-level Kindle does not feature a backlit screen. If you’re looking to cover all of the bases in an emergency situation (such as a power outage scenario for example), then you’re going to want to factor this into the equation and either pair with a high quality headlamp or tactical flashlight for reading at night or in the darkness. Another important consideration with the foundation Kindle is that it isn’t waterproof out of the box, meaning you’re going to want to keep it protected from liquids and the elements if you plan on bringing it along with you. With this in mind, it’s a good idea to also pack a waterproof pouch or case to keep your portable library dry at all times. Alternatively, if you’re looking for a device that comes with full submersion waterproofing as standard, then check out the Kindle Oasis below. If you’re looking to put together a bug out bag which incorporates a budget e-reader with a high capacity and the ability to operate for weeks on a single charge, then the entry-level Kindle is a great place to start. 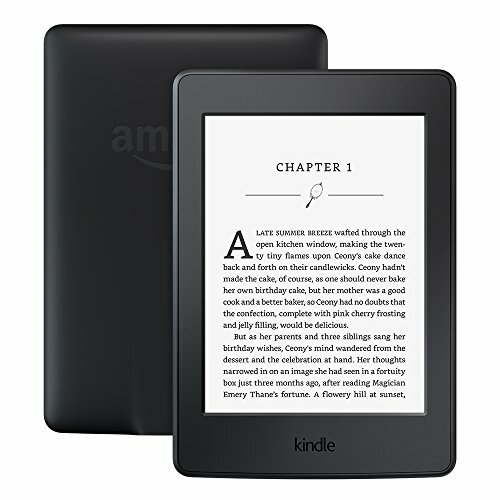 A 6″ glare-free screen with a resolution of 167 ppi means you’ll be able to read text in bright sunlight conditions, however, unlike the other devices in the Kindle family, the basic model doesn’t include any form of screen lighting for reading in dark conditions. In terms of size and weight, the Kindle is an excellent choice if you’re pushed for space on your packing list, coming in at an almost unbelievable 5.7 oz (161g) making it the lightest of all of the Kindle devices by a relatively wide margin. 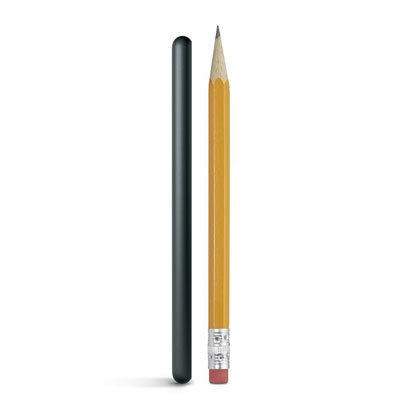 Similarly, while at 0.36″ it’s not the thinnest device in the range, the standard Kindle is the smallest in all other regards and is only beaten on this front by the Kindle Voyage (more info below) which is a mere 0.30″ at the thickest point on the device. The Kindle Paperwhite is the next step up from the base-level Kindle device and brings a couple of important improvements which bring considerable benefits if you’re looking for an excellent survival e-reader. One of the major advances with the Paperwhite is the inclusion of a built-in light powered by 4 LEDs, meaning you’ll be able to read whatever’s on the page (or screen) no matter the level of darkness around you. This illumination feature alone makes for an invaluable functionality improvement if you need to read in low light situations without having to break out a flashlight or portable lamp. The Paperwhite also brings a higher resolution screen to bear, offering 300 ppi on its 6″ glare-free screen. As with the original Kindle, the Paperwhite is not waterproof by default, but pairing with a high-quality waterproof case, while adding additional weight, will make your device resistant to water as well as significantly increasing the ruggedness and durability with a shockproof design. There are a couple of key distinctions that separate the Paperwhite from the entry-level Kindle but when it comes to emergency preparedness features, the key difference is the inclusion of an inbuilt lighting solution for reading in dark conditions. As you’ll be aware if you’ve owned an ebook reader in the past, this is a huge advantage when it comes to nighttime use and it’s arguable (unless you have a flashlight at hand at all times) that this functionality is essential in an emergency situation – whether bugging in your home without power, or camping out in the wilderness. In terms of size and weight, the Paperwhite comes in slightly heavier than it’s smaller sibling at around 7.2 oz (205 g) and measuring 6.7″ x 4.6″ (169 x 117mm). Although there’s an increase in weight from the entry-level Kindle, as a trade-off, this difference is likely to be negligible given the increased screen and lighting offered by the higher end device. 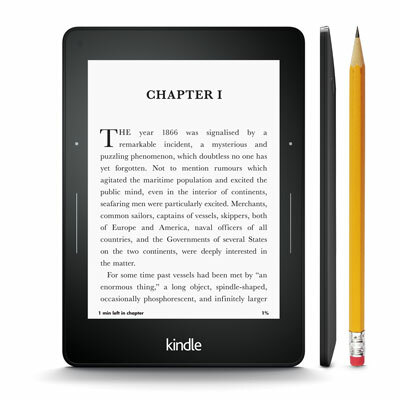 The Kindle Voyage includes a 300 PPI high resolution screen alongside a long-life battery providing weeks of power, and an adaptive front light for use in the light or dark. While you’re still going to want to invest in a high-quality waterproof case or cover for the Voyage to ensure protection from water, durability comes built in as standard with a reinforced glass front and magnesium back. With 4 GB of storage, the Kindle Voyage is designed to hold a lot of information meaning you’ll be able to carry every guide, instruction set, or novel with you without a second thought. The 6″ glare-free display that forms the front of the Voyage is designed for use in all light conditions thanks to the inclusion of 6 LEDs and an adaptive light sensor which keep reading conditions optimal, no matter the exterior lighting level. Page turning on the device is handled by a combination of touchscreen functionality as well as physical page press keys. Size is always an issue when it comes to packing a bug out bag and the Voyage has this covered with an unbelievably thin design, coming in at just 7.6mm thickness. This not only reduces the overall weight and footprint of the device (allowing you to slip it into a spare document pocket or recess) but also means you can easily complement with a lightweight waterproof case to maximize the durability of the device in adverse conditions. If your bag and carrying capacity allow it, then this combination should provide your device with both the resilience and minimal burden to see you through any situation where you need to bug out on foot. If you’re still able to connect to the network in an emergency, the Voyage comes with two connectivity options; a Wi-Fi only option which weighs 6.3 oz (180g), or a Wi-Fi + free Cellular connection variation which weighs in at 6.6 oz (188 g). The Kindle Oasis is the first of the range to be fully waterproof up to IPX8, meaning that the device is safe from water, right out of the box. This feature alone is obviously a huge advantage when it comes to a device suitable for use in adverse conditions and makes this a natural choice for a bug out Kindle that can handle a wide variety of conditions. While perfect for use by the pool or at the beach when times are good, investing in an Ebook reader with this level of waterproofing will see you right if you ever find yourself using the device when the situation isn’t so great. Weight and strength/durability are absolutely essential considerations when it comes to picking any piece of survival equipment, and the Kindle Oasis meets these requirements perfectly with an ultra-thin 3.4mm display, an anodized aluminum back and what Amazon claims is their “strongest cover glass”. 12 LEDs are the basis for a built-in light solution which means that whether you’re in the middle of a desert (glare-free display included as standard) or camping out in a forest at night, you’re going to be able to access the information you need at the touch of a screen. 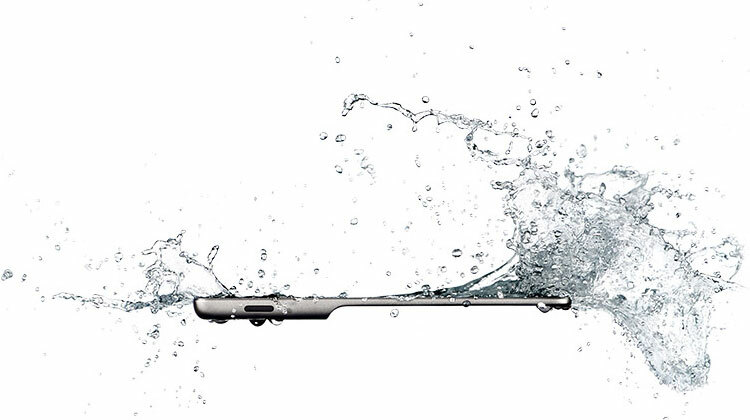 Without a doubt, the stand-out feature of the Oasis is its IPX8 waterproofing which means you’re protected from showers through to full submersion in 2m of water for up to 60 minutes. What this means of in practice of course, is you can rest easy that your survival ebook reader (and all of the info your carrying on it) is fully protected from the elements without the requirement of an additional waterproof case – a real consideration if weight is an issue. Similarly if you’re planning to prepare your kit for total resilience against natural disasters such as flooding or tsunami, this is a priority feature you want to be looking for in the device you choose for the job. The Kindle Oasis comes with either 8 GB of storage as standard or a higher capacity version providing 32 GB – a good choice if you’re looking to store more space-hungry media like audiobooks or magazines. In terms of screen provision, the Kindle Oasis utilizes a 7″ high-resolution display offering 300 ppi which can be read in bright sunlight without glare. Similarly, when the light levels drop, this ebook reader has you covered with an adaptive front light. With a single charge of the Oasis seeing the device through weeks at a time, you’re guaranteed to be covered against running out of power for a prolonged period of use when you’re on the road, in the wilderness, or hunkering down. As a bug out Kindle, the durability and light weight form of this device make it a great choice for incorporating into a bug out bag strategy if space and time allow. With all of our rundowns, reviews, and guides we reference as many expert sources, and real world user reviews as possible so we’re able to provide the most relevant and educational information on the ins and outs of the best survival Kindles and ebook readers. Finding the best survival ebook reader or bug out Kindle for your specific situation is ultimately a highly personal activity with individual needs and preferences sometimes varying considerably between people, locations, and uses. With these considerations in mind, this guide looks to provide advice on our own opinions of the best survival e-reader devices and bug out Kindle options available today, however, it’s always important to carry out your own due diligence to find the best solution for you when picking a suitable device that’s perfect for your situation.